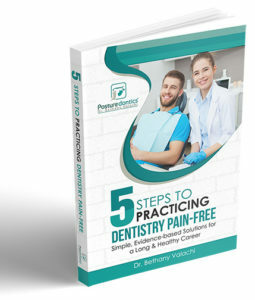 Dr. Bethany Valachi is a prolific author who has published a book, produced several ergonomic and exercise DVDs, and authored over 60 articles in numerous peer-reviewed dental journals. Access some of Dr. Bethany Valachi’s many publications below, to learn more about how to resolve your pain, prevent potential disability, and improve your quality of life. 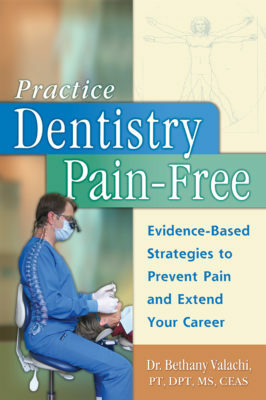 Read an excerpt from Bethany’s book, “Practice Dentistry Pain-Free: Evidence-based Strategies to Prevent Pain & Extend Your Career.” Take the leap and begin your journey to a healthier, happier future. Check out the book in our store today! Watch video from Bethany’s DVDs and lectures: Patient & operator positioning, stool adjustment, home exercise for dental professionals, wheelchair transfers in the operatory and chairside stretching. These valuable videos will provide you with insights on how to prevent your pain and operate more comfortably. Click here to view video excerpts! Bethany has published over 60 articles in peer-reviewed dental journals, including the JADA, Inside Dentistry, Dentistry Today, AGD Impact, Australian Dental Journal and RDH. 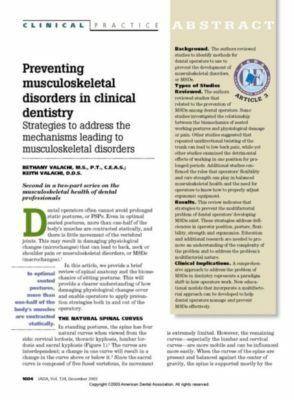 You’ll find many of these articles, including exercise, equipment, specific MSDs, patient positioning and much more on her Blog. On the Blog, you’ll also find helpful videos to help you can gain more knowledge to prevent your pain and learn ergonomic & wellness strategies that will keep you healthy and happy in your practice. Access Blog articles & videos, and take control of your health now! 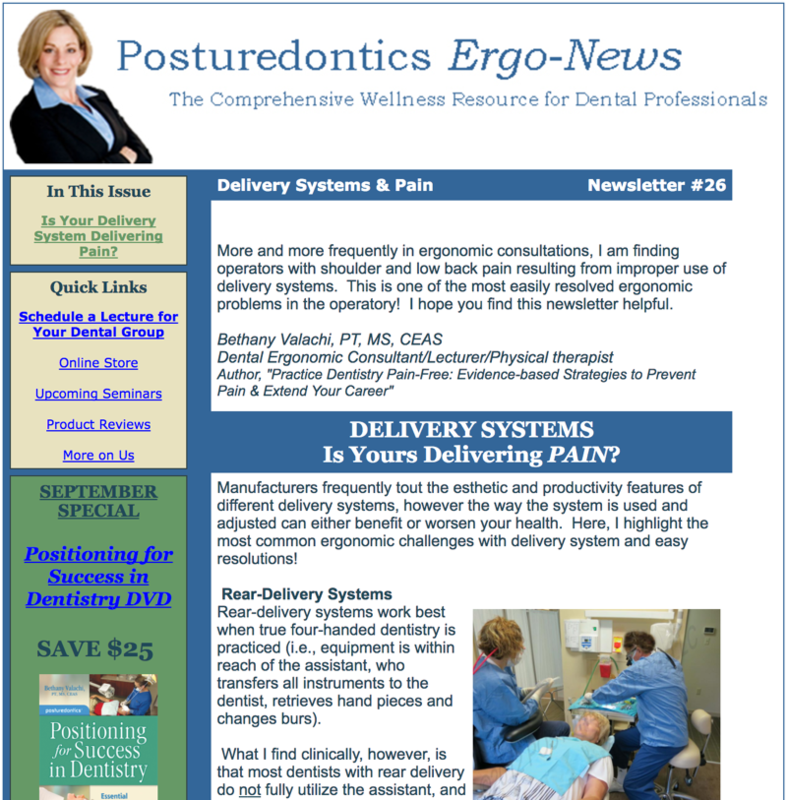 With Dr. Bethany Valachi’s newsletter you can learn about all the innovative ergonomic practices and equipment that are removing pain from dentistry and allowing dental professionals to be healthier than ever. Once you join Dr. Valachi’s Online Newsletter you’ll received periodic newsletters (every 2-3 months) that are packed with the newest evidence-based education (ergonomics, dental products and wellness) that is not included in Bethany’s book, seminars, articles or DVDs. Each newsletter focuses on a specialized theme–view sample newsletters below. Register today for the free newsletter!